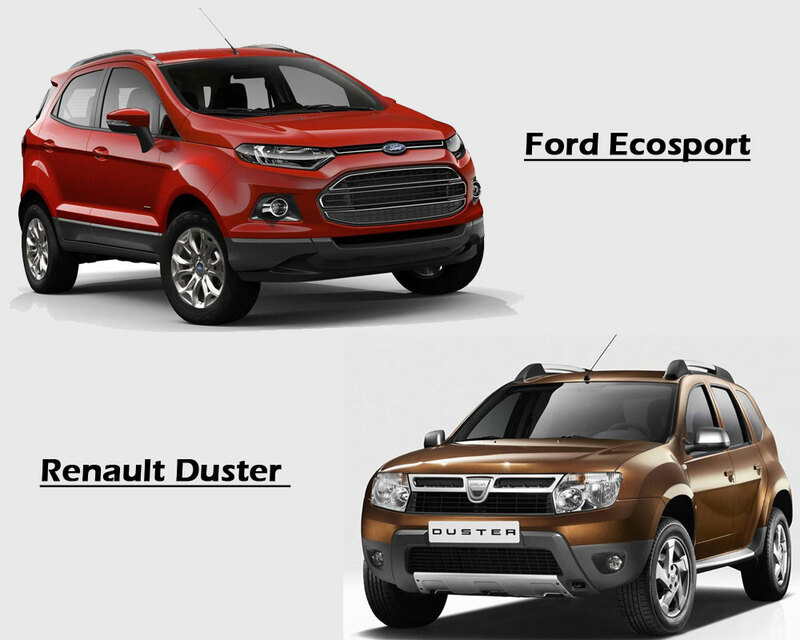 There is a great eagerness for two cars in the Indian automobile market, Ford Ecosport and Renault Duster. The reason behind this is the emerging middle class Indians those want a better SUV cars in lower price range. We have studied various aspects of the cars and found comparable differences between them, so that you can easily take your decision that which one is better for you. Both the cars are vastly different from each other in the first vision of user because Ford Ecosport has sporty look where as Renault Duster has simple and decent look. Duster has stylish alloy wheels, front grille and headlamps, that provide it a great look where as height and back stepney of Ecosport give it an aggressive look. In terms of interiors, Ecosport has two colors of interiors while Duster has very simple interiors. Both cars have entire space for front passengers with full scope for legs and head. But Ecosport has an additional feature which is its arm rest. The height adjustment for driver seat and the steering adjustment of both the cars provide very comfortable long drives. Three adults can easily sit on the second row seats of Duster but there are only two adults can easily sit on the back seat of Ecosport. Both cars have arm rest with cup holder features but in case of boot space, Ecosport is more spacious. Ecosport gives you climate control and synchronization feature to make voice activated. These two features are missing from duster. In terms of safety, Ecosport has 6 airbags while Duster has only 4 airbags. Both cars are equipped with 1.4 litre engine but Duster is more powerful because it provides 248Nm power at 3900rpm torque but Ecosport gives only 204Nm power at 3750rpm torque. Duster has 6 gears and it achieves the mark of 100kmph in just 12.7 seconds but Ecosport has only 5 transmission gears and it is capable to touch the mark of 100kmph in 13.2 seconds. Duster has maximum speed 175kmph but maximum speed of Ecosport is less than 5kmph compare to Duster. There are minor differences between the mileages of the cars. On the city roads Duster gives 11.8kmpl mileage where as Ecosport has 12.2kmpl mileage, but on highways performance of Duster rises by 1.4kmpl compare to Ecosport and touches the mark of 21.8kmpl. So, overall duster gives 14.3kmpl average which is more than Ecosport by 0.5kmpl. Platform of Ecosport is based on fiesta, and more balanced in term of its chassis. Overall Ecosport has better handling but Duster has good handling on wide and free roads due to its wide tyres. Both cars have poor controlling on undulating roads.